Meidani, M., Aminzadeh, Z., Faghih, M., Ahmadi, N. (2014). Are the Preventive Services For HHV-8 Necessary in HIV Positive Persons in Central Zone of Iran?. Iranian Journal of Pathology, 9(2), 133-137. Mohsen Meidani; Zohreh Aminzadeh; Mahya Faghih; Nooshin Ahmadi. "Are the Preventive Services For HHV-8 Necessary in HIV Positive Persons in Central Zone of Iran?". 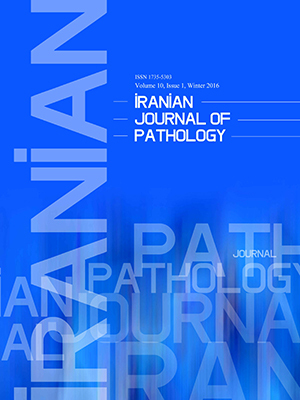 Iranian Journal of Pathology, 9, 2, 2014, 133-137. Meidani, M., Aminzadeh, Z., Faghih, M., Ahmadi, N. (2014). 'Are the Preventive Services For HHV-8 Necessary in HIV Positive Persons in Central Zone of Iran? ', Iranian Journal of Pathology, 9(2), pp. 133-137. Meidani, M., Aminzadeh, Z., Faghih, M., Ahmadi, N. Are the Preventive Services For HHV-8 Necessary in HIV Positive Persons in Central Zone of Iran?. Iranian Journal of Pathology, 2014; 9(2): 133-137. Background and Objective: It is presumed that human herpes virus 8 (HHV-8) is the necessary cause of all different forms of Kaposi’s sarcoma which is the most common neoplasm in HIV-infected persons. In this study, we wanted to determine the prevalence of HHV8 infection in all the available Isfahan (Central Iran) HIV positive individuals in comparison with healthy blood donor, and also investigating the risk factors of HIV infections in both groups. Material and Methods: Inthis cross sectional study, the samples were consisted of 50 healthy HIV –negative blood donors and all the available Isfahan HIV positive individuals (55 persons). The selected people fulfilled a questionnaire about personal demographic information. The blood samples were examined using Biotrin kit to detect anti HHV8 antibody (IgG). Results:In HIV positive group, 10 persons (18.2%) tested positive for HHv8, but none of the control group had positive test. We analyzed risk factors for AIDS and found, as expected, strong associations between HIV infection with addiction, being in prison, travelling out of Iran, low educational status and being single or having multiple sexual partner but there is no differences between HHV8 positive and negative group. Conclusion:The prevalence of HHV8 in HIV positive persons is high in Isfahan and preventive care may be beneficial. A future study including a large population from different high risk groups and general population in Iran is needed in order to define seroepidemiology and risk factors associated with HHV8 infection. Longo D, Fauci A S, Kasper D, Hauser S, Jameson J, Loscalzo J . Harrison ´s principle of internal medicin 18th ed. New York:McGraw-Hill; 2012. Cesarman E, Chang Y,Moore PS, Said JW, Knowles DM. Kaposi sarcoma- associate’s herpes virus- like DNA sequences in Aids- related body cavity based lymphomas. N Engl J Med 1995; 332(18):1186-91. Lazzi S, Bellan C, Amato T, Palummo N, Cardone C, D'Amuri A, et al. Kaposi's sarcoma-associated herpesvirus/human herpesvirus 8 infection in reactive lymphoid tissues: a model for KSHV/HHV-8-related lymphomas. Hum Pathol 2006;37(1):23-31. Gnann JW, Pellett PE, Jaffe HW. Human herpesvirus 8 and Kaposi's sarcoma in persons infected with human immunodeficiency virus. Clin Infect Dis 2000;30 Suppl 1:S72-6. Jalilvand S, Shoja Z, Mokhtari-Azad T, Nategh R, Gharehbaghian. A Seroprevalence of Human herpesvirus 8 (HHV-8) and incidence of Kaposi’s sarcoma in Iran. Infect Agent Cancer 2011;28:6:5. Dongre A, Montaldo C. Kaposi's sarcoma in an HIV-positive person successfully treated with paclitaxel. Indian J Dermatol Venereol Leprol 2009;75(3):290-2. Schwartz RA, Micali G, Nasca MR, Scuderi L. Kaposi sarcoma: a continuing conundrum. J Am Acad Dermatol 2008;59:179-206. Ahmadpoor P, Ilkhanizadeh B, Sharifzadeh P, Makhdoomi K, Ghafari A, Nahali A, et al. Seroprevalence of Human Herpes Virus-8 in Renal Transplant Recipients: A Single Center Study From Iran. Transplant Proc 2007;39(4):1000-2. Dukersa NH, Rezza G. Human herpesvirus 8 epidemiology: what we do and do not know. AIDS 2003;17(12):1717–30. Gharehbaghian A, Zaghal A, Farhudi Langerudi M, Karimi GH. Seroepidemiology of the human Herpesvirus (HHV-8) in the haemodialysis patients blood donors and HIV-positive individuals in City of Tehran. Journal of School of Public Health and Institute of Public Health Research 2006;4(4):57-62. Ogoina D, Onyemelukwe G, Musa BO, Babadoko A.Seroprevalence and determinants of human herpes virus 8 infection in adult Nigerians with and without HIV-1 infection. Afr J Health Sci 2011;11(2):158–62. Ablashi D, Chatlynne L, Cooper H, Thomas D, Yadav M, Norhanom AW, et al. Seroprevalence of human herpesvirus-8 (HHV-8) in countries of Southeast Asiacompared to the USA, the Caribbean and Africa. Br J Cancer 1999;81(5):893–7.